Maybe we can help each other out a little here. Have you found a gray that you love? 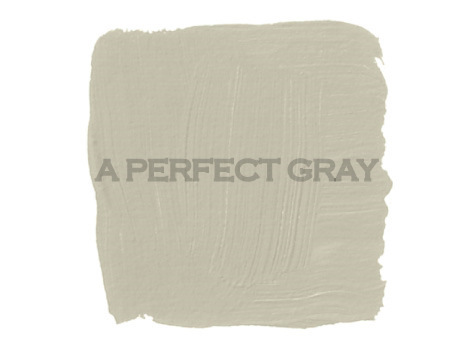 Leave a comment telling us about your perfect gray. 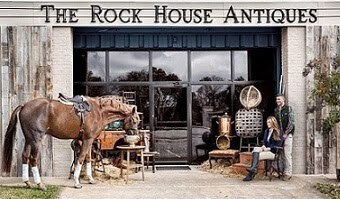 Maybe we can put together a piece like Paige at Tracery Interiors did recently on blues. That was awesome! I'm no help, but I do love that first picture and the blue against the gray..perfect!! This is such a great idea as i'm searching right now. I'm really liking to Martha stewart grays but I have yet to try them out. Sounds very much like the new House Beautiful book, Colors For Your Home that I recently picked up. I'll look up some grays for you and be back later! Good Lord, I love that room by Nate Berkus. I hope he's receiving a commission from IKEA on those staggered stripe rugs he popularized. There was a storm when I first saw the house, all the colours in the garden looked super-rich and the house across the way was livid against a warm gray, almost purple sky - the exact gray I wanted. I painted every room except on the ground floor that gray, with all the Regency detailing white. It was perfect. A lot of the charm was that the house was so beautifully proportioned, with original sash windows and French doors, deep skirtings and handsome architraves and cornices. The Quakerish gray and white set it off beautifully. I love Ashwood by Behr. I have it in my bedroom and LOVE LOVE LOVE it! sea pine by ben moore AC-17. surprisingly gorgeous and not at all in a weird, greenie way. I love reader input, I really enjoy seeing what other people suggest, will keep my eyes peeled for good grays! XO! I thought about getting a bottle of the hottest summer nail poslish shade from channel, Particuliere, and having someone mix the color to match. That particular shade goes well with all skincolors, which I would imagine would translate well into all interiors as well. (1) Benjamin Moore AF-695 Eternity @ 30%. A true, light gray. Used in very bright 3rd floor bedroom. (2) Benjamin Moore Calm. It's actually very calming...Used in a dining room and living room. Sophisticated look. (3) Benjamin Moore French Beret. Used in a kitchen as the backsplash. It looks just like the name of it and really anchors the room. (4) Benjamin Moore Feather Gray -- the first gray wall I ever painted and still love. It has a hint of light blue in it. I had a red upholstered antique sofa in front of it and it really mixed well. 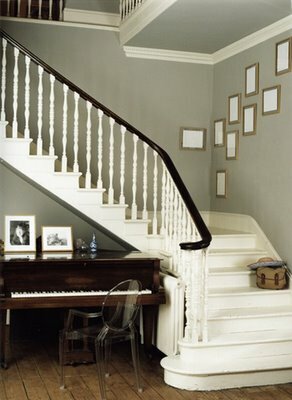 Have mentioned this before, but worth repeating...Farrow and Ball Elephant's Breath. Any good paint store can match it with Benjamin Moore for a lot less money. 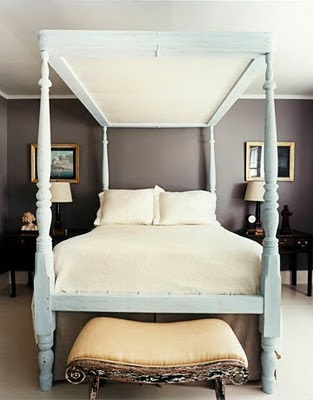 AND Benjamin Moore's Cape Hatteras is gorgeous!!!! I love gray-every single shade and hue! I remember getting in a serious discussion with the design principal at my old firm. He thought it was so gloomy and I firmly defended my love of it. It was the next year that the gray trend happened in a big way. I still feel smug about it! My perfect gray in my living room with strong E/NE indirect light is Sherwin-Williams Olympus White. It's actually a light true gray very similar to BM Horizon. I painted almost a year ago and still love it. Farrow and Ball's 'Down Pipe'. It's medium dark but not darkdark. It changes all the time in different lights - sometimes yellowish, sometimes blueish. I have it in the kitchen. When I come into the room and see it I swoon in a way you're supposed to reserve for lovers. Porter's Paints 'Chocolate Torte'. It's darkdark. Almost black. But witha squeeze of blackberry stirred through.Sort of a purply dark-grey-almost-black. I have it in a study which is a light room so it almost disappears. And in a bedroom, which is quite dark, so it has to be enlivened with lots of white trim. Something I'm always puzzling over is the effects of light levels on various greys. Which ones do best in dark rooms, which in light, whether it's best to use lighter shades in darker rooms etc etc. Any chance of a post on that? I have just used Sherwin Williams "Stone Lion" on an urban loft style space. It's a warm, muddy, medium, not too light, but not too dark. I am pairing it with accents in turquoise and a variety of blues, so its warmth works well, but I am also using some really toned down, warm reds with it. The space was originally built as a ballet studio in 1957, so I am creating a headboard for the bedroom out of the doors from a "57" Chevy pickup truck! Turquoise, of course, with "Western Hardware" written on them. "Stone Lion" is rich and warm enough to keep the other colors from looking to syrupy. A "wet look" finish on the concrete floors also gives some brightness to the grayness. I just repainted my living and dining room with Restoration Hardware's "Graphite". Almost done with the trim, which is Behr's "Vermont Cream". The gray seemed a bit deep at first, but the crisp white really gives the room a crisp, clean, classic feel. I'm looking forward to picking up my new sweep arm chairs from west elm this weekend and adding some bright accessories that really make the rooms pop. I'm totally digging this gray and white style - love your blog! All Tracery tried and true! Farrow and Ball Blackened for my dark hallway is like walking through a silver cloud. Amazing. And Pavillion Gray for the living room is smashing. Tried to match the Blackened in BMoore for another room having spent the wad on the above cans of paint but it just does not compare. I will say that the F+B although expensive, goes a long way (only needed one can for the LRoom), has NO odor and is very eco-friendly. Just painted my dark, windowless hallway Farrow and Ball Blackened. Its like walking through a silver cloud. I ran a marathon to get this stuff like a crack addict on the Friday before 4th of July from NJ into Soho. Only one store in NJ carries it and they have limited color selection. Spendy, yes. Worth it? For sure. Great coverage, no smell, eco-friendly. Only needed one can for LR. Tried to match Blackened in BMoore. No dice. Not even close. Looks like it belongs in an OR. the hubs and i have a shotgun-style loft with huge timber pillars complemented gorgeously by sherwin williams' dovetail paint (#sw7018). it's rich, dark and warm. we love it! fun to see colors others recommend! I'm really looking for a kitchen cabinet gray. Any thoughts? Something light & true gray. I LOVE Elephant's Tusk by Benjamin Moore. It's not grey, but more of a greige. Great blog!! I painted my living room, my closet this beautiful dark gray from Sherwin WIlliams called Stonecrest SW2138 i believe. I even mention it on my guest post for Sketch42 blog post on July 14th! I am in the process of painting my master bath in Restoration Hardware "Graphite." I tried several greys before settling on this one...it has a "muddy" quality and is deep while not being dark. It has a hint of brown with a lavender undertone, and may be the perfect grey. I have used Benjamin Moore "Coastal Fog" in two family rooms, and it is the perfect neutral. Has some green undertones. We just redid our living room and used Benjamin Moore's "Sidewalk Gray" on the walls and the next lightest, "Tundra", on the ceiling. Crisp, white, thick crown for contrast. Our existing sofas are a french blue, so these grays have a blue untertone. I painted my powder room BM Chelsea Gray, from the Historical Color Collection. It looks great with white trim and wainscotting. 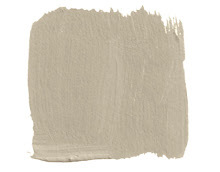 I like Benjamin Moore Raccoon Hollow 978 if I need a linenish gray…More griege but still delightful. We just did our teeny bathroom in Martha Stewart Sharley Gray also! We went through 6 different gray/blues before landing on it. It's dark enough to pop against our white/tan tiling and light enough that our little bathroom doesn't get smaller. Well, I've tried many grays in my livingg room, were always too green or too blue. Grays capture the colors of the environment where you live, so, say you live in the forest, if you choose a gray with green or blue undertones, it will turn green or blue because of the green light comming in from your windows. It's ok if you want gray green on your walls, can be very pretty, but if you want a real gray, maybe you won't like the effect of the light coming from outside and reflecting on your gray walls. Living in the mountains I had this problem, i've tried 4 different colors before getting the right gray, for my walls it's the perfect gray, it's called "silver sateen" "UL-260-16", from Behr. I love it!! it's a real gray and the light coming in from the outside gives it a very subtle green/blue under tone. It's a soft color but strong enough to stand out, not too light, not too dark, it's modern and fits with everything. And what can I say about Behr paint, this paint is fantastic, too coats and you're done, no primer before. I use to paint with Benjamin Moore paint but now my favorite is Behr. My favorite grays that I have used are Benjamin Moore Revere Pewter, HC-172 and Gray Owl 2137-60. Revere Pewter is the perfect greige, sort of a no color, color...if that makes sense. Gray owl is also a soft gray, but is a bit cooler, has more blue in it. Hope this helps. So happy to have found this site! I have been a huge fan of Farrow Ball French Gray #18 for years and have had that paint on my lower kitchen cabinets in a cottage home in Maryland. Unfortunately, a HUGE home was put up next door (quite close to the source of light in the kitchen) that is painted dark red. My beautiful French Gray cabinets are now a muddy looking olive. If anyone knows where I can go from here, please adivise! Susan - The term 'French Gray' can mean anything. It is a simple matter of what name is placed on a paint chip. 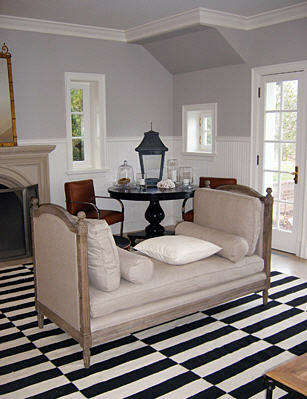 'French Gray' can have an undertone which varies from one paint maker to the next. Apparently the color on your kitchen cabinets has a green undertone. It would be advisable for you to secure a shade of gray which has a blue undertone. But be careful and test it - too blue an undertone will make your cabinets appear lavender from the influence of the red. Test, test, test - be very picky and do not 'settle' for anything that does not deliver EXACTLY what your eye needs to see when you look at those cabinets. Be certain to view them at different times of the day to ensure you are getting the shade you desire, based upon the level of light - however much or little exists. 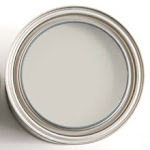 I always suggest shades of gray for wall color - but not by using pre-existing paint chips. In my estimation they are merely a starting point for one's consideration. Customized color provides you with exactly that which your mind's 'eye' imagined when you decided to use gray for your environment. For example, color chips generally provide three or four shades - with the top shade being an 'off-white' and the bottom shade being quite dark. The shades darken as the chips cascade down the card. Review the shades positioned on the second and third position. If you like them both, but one is too light and the other is too dark, then perhaps the creation of a color BETWEEN the two will be exactly what you are looking for. The staff at the paint store can customize to your specification. They will frequently add 1/4 additional color and if you still need to see it yet darker, they will add another 1/4, etc. Purchase a quart - test it on your desired area. Be very critical - gray is just so wonderful - you DESERVE to have it be perfect for your customized environment. The staff at the paint store will work with you and do their best to help you get your color perfect - they want a satisfied customer. Your receipt should reflect the 'formula' you have purchased so that you may reproduce it, should you need to do so. Also, if you customize your shade of gray and come to realize that it is just the best ever, please keep in mind that you can return to the paint store with your receipt, request to have the formula enhanced with yet another 1/4 more color or 1/4 less in order to create another customized shade for another room. My entire house is done in gray - I simply wouldn't consider anything other than, perhaps, white. Also, to enlarge the feel of the space, I generally paint the ceiling in gray also. If the shade isn't too dark, I just roll walls and ceiling. If the shade is rather dark, I lighten it - only somewhat - with some white prior to rolling the ceiling. As a designer, I do everything myself. I just need that 'hands-on' experience. Strictly for reference purpose, please know that the brand 'Behr' is a wholly owned subsidiary of Sherwin Williams. As this company wanted to be certain that they were participating in the large hardware store selections, they market their product under another name to retain the distinctiveness of their product. Clearly both brands are quite good and deliver a high quality result. Sherwin Williams gray clouds! We loved the paint in our living room! Benjamin Moore... Bunny Grey on the walls with Thundercloud grey as accents. Crown and mouldings , baseboards in a crisp white...... oh my. All set off with wall decos of mirrored butterflies...... sure worked for my basement bedroom.